'Big human tragedy' in the Med. 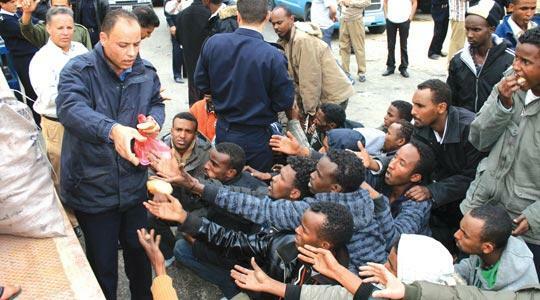 A Libyan policeman distributing bread to migrants who were rescued yesterday off a boat that sank in a violent storm off the coast of Libya on Sunday. More than 200 illegal immigrants were presumed dead after the boat they were travelling in sunk some 30 kilometres off the Libyan coast, the International Organisation for Migration said yesterday. The boat with 257 migrants on board sank on Sunday after high winds struck the area. "Twenty-three people were saved and 21 bodies were retrieved," Laurence Hart, the IOM chief of mission in Tripoli, told the AFP news agency. He confirmed that the Libyan coastguards were also searching for two other boats believed to have gone missing in the storm. However, it was unclear whether the two other boats were fishing vessels or had migrants on board. Another boat that found itself in difficulty was towed back to shore by Libyan rescuers. The representative of the United Nations High Commissioner for Refugees in Malta, Neil Falzon said this was a "big human tragedy". "It shows the desperation that prompts these people to leave at all costs. If an accident of similar proportions occurred somewhere in Europe, people would stop to think. Hopefully, this great loss of human lives would remind us Europeans of the gravity of the situation. Hopefully, it would help us to stop and think," Dr Falzon told The Times. Earlier, UNHCR High Commissioner Antonio Guterres described the sinking as "the latest tragic example of a global phenomenon in which desperate people take desperate measures to escape conflict, persecution and poverty". The disaster occurred well within the Libyan search and rescue area and commercial vessels in the vicinity were diverted to the zone to provide assistance, local army sources said. April normally marks the start of the immigrant season with hundreds of small rickety boats and sometimes larger overcrowded fishing boats attempting to reach European shores. Despite the inclement weather, over the past three days around 400 immigrants landed in Sicily and a further 222 in Lampedusa, Italian media reported. Meanwhile, Italian Interior Minister Roberto Maroni has promised that the planned joint maritime patrols between Italy and Libya would start on May 15. With 1,770 kilometres of coastline, Libya is a popular destination country and transit point for immigrants from eastern and southern Africa heading for Europe. In an unprecedented change in immigration patterns, during the first two months of the year more than 600 immigrants landed in Malta. Sunday's tragedy off the Libyan coast is one of the worst illegal immigration-related dramas since 2000. 2000 - December 13: AUSTRALIA - 163 illegal immigrants, from the Middle East, are reported missing during a passage from Indonesia. 2001 - October: INDONESIA - Some 350, mainly Iraqi, immigrants drown off the island of Java. 2003 - June 20: TUNISIA - 12 are found dead and 200 listed as missing after a boat carrying illegal immigrants from several African countries sinks. 2004 - March 31: GULF OF ADEN - More than 100 Ethiopian refugees, who were attempting to reach Yemen, are listed as missing after the boat they were travelling on collides with a Somali vessel. 2005 - March 3: the GULF OF ADEN - More than 100 Ethiopians and Somalians are killed when trying to sail to Yemen. 2005 - August 16: CENTRAL AMERICA - 104 immigrants are reported missing after an Ecuadorian boat that was transporting them illegally to central America sinks. 2006 - September/October: The GULF OF ADEN - At least 150 Africans are reported as dead or missing as they seek to reach Yemen. Some of the would-be immigrants are reported to have been thrown to the sharks by their traffickers. 2006 - Mid-December: SENEGAL - Around 100 illegal immigrants, seeking to reach Spain, are lost when their dugout sinks. 2006 - December 29: YEMEN - 34 are killed and 124 listed as missing at sea after Yemeni police open fire on a group of boats attempting to smuggle 515 people from Somalia to Yemen. 2007 - Feb: THE GULF OF ADEN - At least 107 Ethiopians and Somalians are drowned as they try to reach Yemen. 2007 - March: YEMEN - At least 100 people are dead or missing after smugglers brandishing knives forced hundreds of Somalis and Ethiopians into high seas off the coast of Yemen. 2007 - June: ITALY - 210 illegal immigrants are drowned or listed as missing off Sicily as they make the crossing from north Africa to Europe. 2007 - December 15-16: THE GULF OF ADEN - Almost 200 people reported as dead or missing when two boats sink between Somalia and Yemen. 2008 - January 18-19: GULF OF ADEN - More than 130 mainly Somali immigrants die as they travel to Yemen. 2008 - June 16: LIBYA - At least 40 are killed and 100 missing after a boat carrying illegal immigrants from Libya to Italy sinks. 2008 - October 10: THE GULF OF ADEN - Some 138 illegal immigrants are thrown overboard by traffickers who were transporting them from Somalia to Yemen. 2009 - January: THAILAND - Hundreds of refugees from a Myanmar minority who were fleeing their country are lost at sea. 2009 - March 30: LIBYA - At least 21 people die and 213 are still missing after three boats sink in a storm off Libya.